I’m hooked on water in the Sierra Nevada and constantly try to find ways to include water in my images whenever possible. The Merced River, one of the major waterways flowing through the watershed of the western Sierra Nevada, usually flows quite high in May and June and it is for this reason that I prefer to visit Yosemite Valley during those months. The Swinging Bridge offers the great view of Upper Yosemite Falls shown below, but the lower section of the falls is generally obscured by trees at this location (you will have to move east into the meadow to see the lower cascade peek through the trees a bit). From this area of Yosemite Valley, Yosemite Falls is generally best photographed in the morning hours. However, I have found that early morning is NOT optimal for one simple reason: due to orientation of the walls surrounding the upper falls, the sun does not light the water directly until mid-morning. Because of this, I wait until the sun has just reached the upper falls and lit them fully, yet the side-lighting at this time is still extreme enough that super detail is seen in the rock walls. 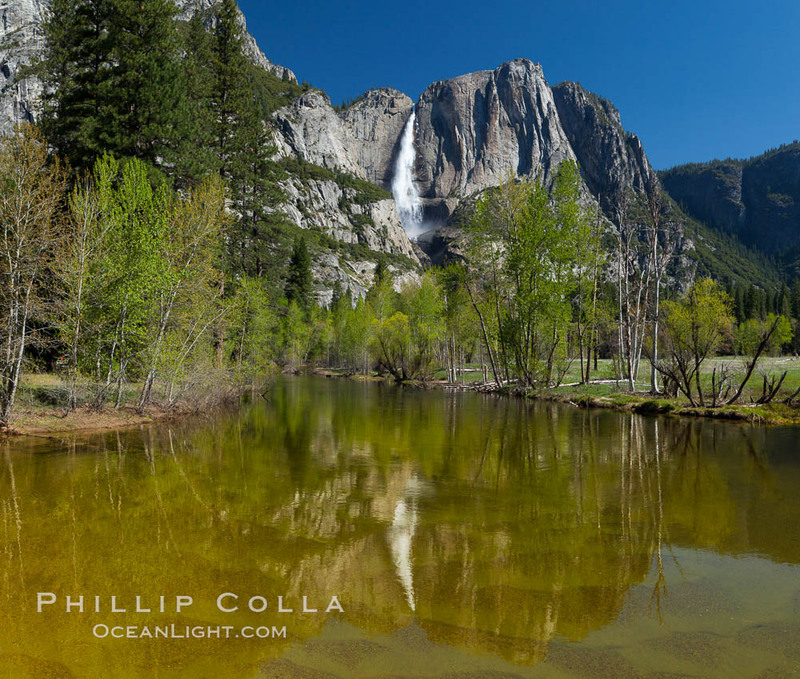 I’ve made many images of Yosemite Falls and also have a gallery of photographs of Yosemite National Park as well. Yosemite Falls rises above the Merced River, viewed from the Swinging Bridge. The 2425′ falls is the tallest in North America.